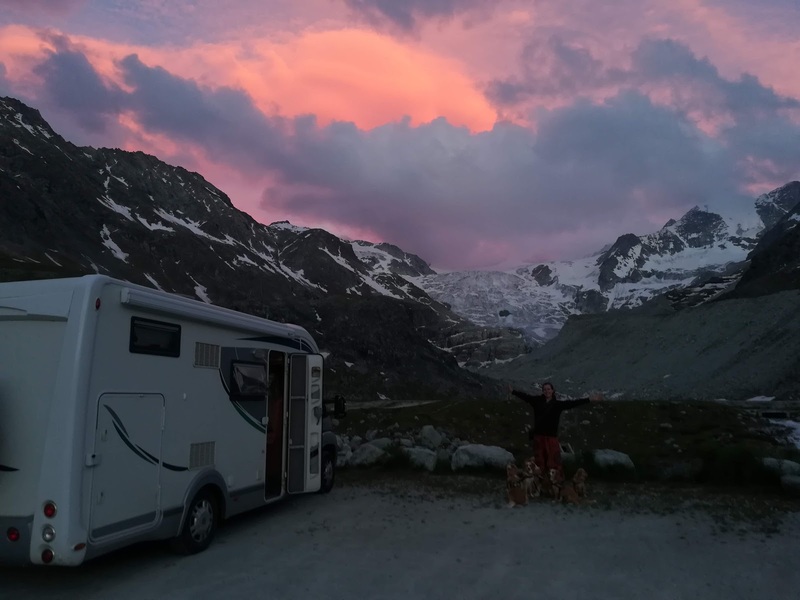 Driving west and descending from the Col du Lauteret first thing on Friday morning we resumed our plan to head deep into the northern part of the Ecrins National Park, aiming for a narrow mountain road to the tiny hamlet of La Berarde at 1750m. Pausing en route to recharge our battery at a handy free electric charging point, we successfully negotiated the 'interesting' single track road deep into the mountains arriving in the late afternoon. After a few “who is reversing first to the passing place” stand-offs with French motorists (we won) and with a vertical cliff on one side and a vertical drop metres away on the other we resolved upon arriving that we were staying at least the next few days before tackling that again. Besides, La Berarde is stunning, entirely surrounded by jagged mountains, topped with snow and with 6 or 7 separate valleys full of glaciers to explore on foot. It is a hikers and climbers paradise. Waking after a sub-zero night on Saturday morning we set off on our first hike just as the sun was kissing the top of the surrounding peaks. Heading south-east in the cold air, wrapped up in full winter gear, we threaded our way down the twisting valley, slowly gaining just 250m in height over the next 2 hours. Passing the Refuge de Carrelet and the opening to several other smaller valleys, the view ahead opened to reveal the imposing Glacier de la Pilatte which took our breath away. Slowly approaching, the sun finally reached the valley bottom and we paused for breakfast and to lose some layers, with the glacier now towering above us on the path. At this point the way started to climb steeply some 600m up to the Refuge La Pilatte at 2507m, zig-zagging up the left side of the valley. As the climbing began our view of the Glacier which had kept us company on the approach was lost behind the hill we were ascending, but the 3300m peak of Mont Gioberney to our left gave us plenty to gape at along the way. The climb was tough and the seemingly endless switchbacks over loose rock tired our legs, but after an hour or so of climbing we finally emerged over the crest of the hill to reach the refuge. Our reward for our efforts was the return of the Glacier de la Pilatte, huge and dominating the skyline. It was immense, stretching from the glacial run off below the refuge into the thick snow and ice that stretches up to the summit of Les Bans at 3669m beyond. Words cannot possibly describe the majesty of the view as the pictures can. We sat and cooked up our dehydrated lunch staring across the icy surface – not a bad dining room. After an hours pause we said goodbye to the Glacier de la Pilatte and began the long hike back to the motorhome, with the sun now very hot in the sky. The weather had changed so much since our chilly approach it was like a different valley completely and we arrived back at our motorhome after some 7 hours of hiking feeling tired, but exhilarated. It had been a real classic mountain approach walk and really characterised this area of epic scale.